What are some of the new product trends and cutting-edge applications that shop owners should be on the look out for in 2017 and beyond? What are some of the newer markets to tap into? To answer these questions, as well as address some other emerging trends for the coming year, we assembled a panel of industry experts that included equipment and media suppliers. Our roundtable hosted: David Conrad, Director of Sales and Marketing at Mutoh America, Inc.; Lily Hunter, Product Manager, Textiles and Consumables - Roland DGA; Adam Larson, Global Portfolio Manager, 3M Commercial Solutions; Michael Maxwell, Senior Manager, Sign Graphics Business Development & Marketing at Mimaki USA; Becky McConnell, Product Manager, FUJIFILM North America Corporation, Graphic Systems Division; Jay Roberts, Product Manager, UV Printers - Roland DGA; Sharon Roland, Advertising & PR Manager, Fisher Textiles; and Tom Wittenberg, Marketing Manager, The Americas - Sign & Décor Graphic Solutions Business at HP. What are some of the key drivers and trends shaping the wide-format printing industry in 2017 and beyond? Conrad: Markets such as dye sublimation and textile are opening doors for print shops and service providers to explore new opportunities in: advancements in ink technology and media, along with enhanced printer offerings, combined to make the textile, fashion, specialty and sports apparel markets attractive areas for growth. Fisher's Roland reports that apparel is one of the fastest growing markets for output providers. Wittenberg: Some of the trends that I see from the major brands that drive the wide-format printing industry include a shift from "mass marketing" to "my marketing," meaning that there is a shift from one-size-fits-all to specific messaging designed for very specific target markets or demographics to drive sales. Big data and variable data handling capabilities also will drive segments into new areas of profit. Sustainability is another one as environmental compliance is gaining strength, albeit slowly, but it is now a critical differentiator for more brands than in the past. There is also a greater need for differentiation in the market to capture attention in less than the "seven seconds" a brand has to attract a buyer. Look for more short runs - versioning and customization are becoming commonplace as brands work to differentiate themselves and provide messaging to specific market segments and demographics. In addition, the advent of lower-cost electronic signage is at some point going to be attractive enough to coexist with traditional print signage, resulting in some level of impact on the print business as a whole. How much of an impact, no one knows, but ultimately this will happen. Roland: Retail and trade show markets continue to influence trends in the wide-format industry. Silicone-edge graphics (SEGs) are very popular across both of these markets because of the clean look, easy install and "wow" factor. Fabric graphics add visual and sensory benefits as well as low shipping costs to transport material. Advancements in fabric characteristics add to the vibrancy of color for printed graphics in these systems. Most fabric manufacturers offer multiple options for SEGs that have adequate stretch, a bright white point and are geared towards either frontlit or backlit, depending on the desired end application. In retail markets, SEGs are prominent in window displays and in-store graphics including wayfinding signage and point-of-purchase displays. For trade show exhibit environments, many exhibitors are turning to SEGs for complete booth signage and use them to create free-standing structures or hang them from the ceiling. MoJo backlit fabric, printed by Just Vision It, LLC in Lone Jack, MO, offers two large backlit free standing units. 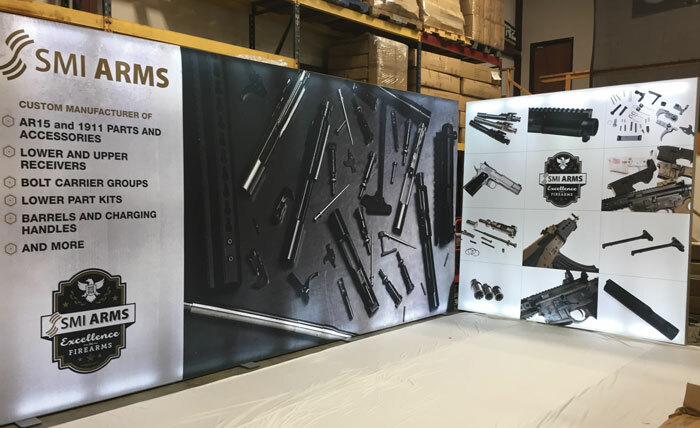 One is 10' x 20' and the side one is 10' x 10' that were created for a gun show in Las Vegas. Larson: Strong competition, both from the manufacturer, distributor and graphic manufacturer sides, are key drivers that shape trends within the industry. People are getting better and better at what they do, so the need to differentiate from the competition is steadily becoming stronger. Understanding how your customers make decisions and where they go to make them continues to change, and is vital information for all vendors to understand. This hyper-competition is forcing graphic manufacturers to search for additional applications to help grow business with current customers, and broaden their offerings to provide more comprehensive solutions for potential new customers. Hunter: Personalization, customization and specialty graphics continue to be in high demand, so we expect continued growth within these markets in 2017 and beyond. Demand for UV printers and inks, such as Roland's VersaUV flatbeds and ECO-UV ink formulations, will grow along with this rising personalization/customization trend. Other than print speed and image quality, uniqueness and creativity are driving the market. Print service providers (PSPs) are looking for cool new products that will help them expand into additional markets and attract new customers. MoJo backlit fabric printed by Just Vision It, LLC. This double-sided backlit was built into a wall so you could see it on both sides. 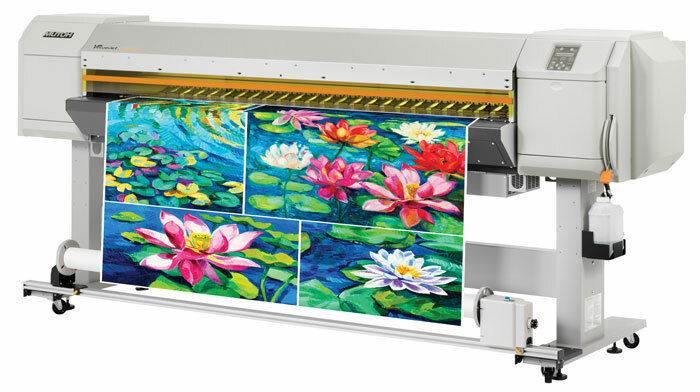 We also expect demand for dye-sublimated products to grow as well, whether it is for environmentally friendly soft signage or eye-catching metal photo panels, which should translate into increased sales for dye-sublimated printers and inks. Another growing trend is the use of cross-technology platforms, which involves using different printing technologies together to create a single project. A couple of examples would be sublimation and engraving on rigid substrates, or eco-solvent print/cut combined with UV technology. I liken the different printing and ink technologies to different tools in your tool box - each tool can do a great job on its own, but when used in combination, they can handle a greater variety of projects and create that "wow" factor. MoJo backlit fabric is specially engineered for light dispersion and produces brilliant backlit prints. 3M Print Wrap Film IJ180mC-120 allows installers the opportunity to take their wrap projects to new heights or depths. Maxwell: Soft signage is driving this market in new directions, and is the biggest trend shaping the industry at this time. Media compatibility and coating technologies combined with the need for smaller inventories and just-in-time production have created an environment that involves many of the available printing technologies. Other applications that signal a positive trend are object decoration and industrial printing, which are largely driven by improvements in UV ink technology. Specific UV printer platforms that cater to this demand have emerged and are driving creativity into new areas. McConnell: We see the industrial market as a growth sector for printing technologies. As we've seen in other areas, demanded turnaround times and run lengths continue to decrease, so manufacturers are looking for ways to get products out the door faster. Inkjet offers a solution because it's the fastest way to produce short runs; there's no pre-press, no plate making, no make-readies and no lamination. Digital inkjet also offers cost reductions throughout the supply chain, with no minimum order quantities and no overprints help reduce waste. With advanced high-speed printers, robust handling systems and expanded ink systems, digital inkjet is a solution for industrial printing. Where are the growth sectors for printing technologies such as UV, latex and solvent? Maxwell: Due to advances in media compatibility and ease of production and shipping, print service providers using solvent, UV, latex and sublimation technologies are all benefiting from the soft signage trend. We predict 2017 as a year where wider printer platforms emerge as a result. We expect adoption of 126-inch platforms that can also produce narrower widths. "3M's Print Wrap Film IJ180mC-114 is a clear printable wrap film, which allows graphic manufacturers to tap into their creative side when offering wrap solutions to their customers," says Larson. Wittenberg: Each of these technologies has its own special characteristics that make it useful. Of the three, solvent/eco-solvent are looking for growth; however, the nature of the chemistry and the hazards it poses to the user are driving the transition of solvent/eco-solvent to UV and latex. For latex, the growth sectors are decoration (+25 percent/year CAGR) and soft signage/textiles (+25 percent/year CAGR), while UV sees significant opportunity in corrugated displays and custom boxes (+50 percent/year CAGR). Decoration and displays, in particular, are in the early adoption phase of growth making it extremely profitable for those that are quick to enter. Finally, there are eco-friendly solutions, such as HP Latex Technology, that have a very strong niche carved out for themselves, not only because of the green characteristics of the latex inks but also due to the recyclability of consumables. 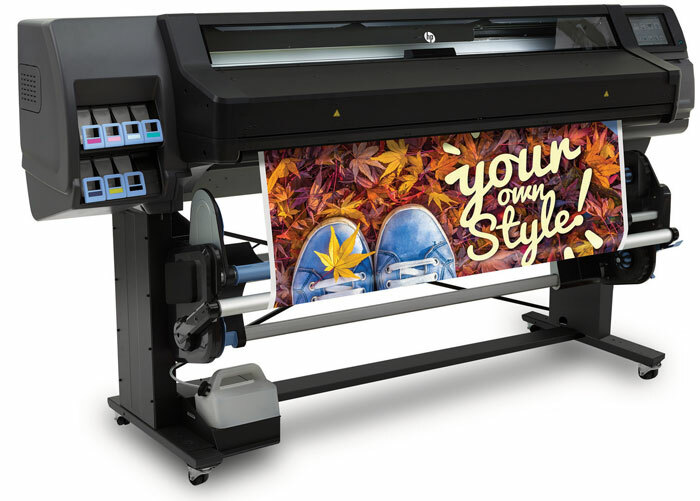 The Mutoh VJ-1938TX is a roll-to-roll printer direct-to-textile machine designed for creating customized fashion apparel, upholstery, interior décor, trade show graphics and soft signage. 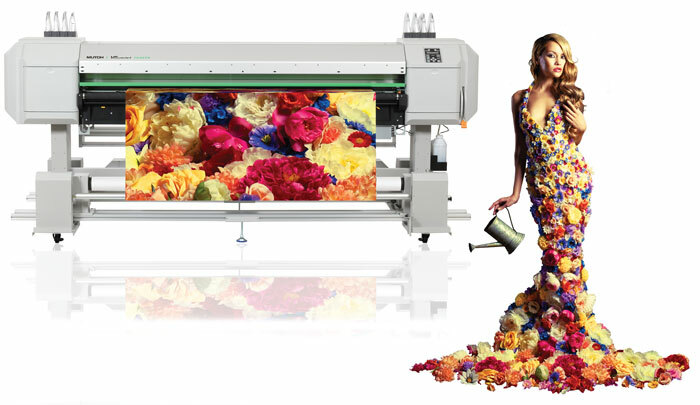 Image courtesy of Mutoh America Inc.
Conrad: The growth sectors are in UV and dye sublimation/textile printing. UV provides alternatives to traditional printing techniques to produce specialty printed products and opportunities to enhance existing markets such as printed electronics, circuit boards, trophy and awards along with the packaging and prototype markets they currently play in. UV ink technology is opening doors to new applications such as backlit film and trade show graphics. Dye sublimation and textile printing are allowing print shops and service providers to explore new opportunities in new markets such as short-run fashion, sports apparel and more. And, while latex has come a long way in growing into print shops, thanks mostly to the intensive marketing push and efforts put behind that technology by major OEMs, eco-solvent ink continues to provide the best solution for superior print quality through its extended color gamut, ability to print on a wider variety of substrates and its proven track record for indoor and outdoor applications that span a wide variety of markets. Larson: Latex continues to be strong sector for growth in the industry. The ease of setting up a latex machine, quick job turnarounds and beautiful prints with latex appeal to most customers, especially those just getting into the industry. UV continues to grow as well. Customers seeking out new applications often find hybrid UV printers to be the best solution, as they allow you to print on more standard roll-to-roll printers and on a variety of different rigid substrates. The addition of white ink allows print providers to do unique things with UV printers. This includes the creation of texture, dimension and neat effects that allow graphic manufacturers to stand out from their competition and those that may not have access to a UV printer. 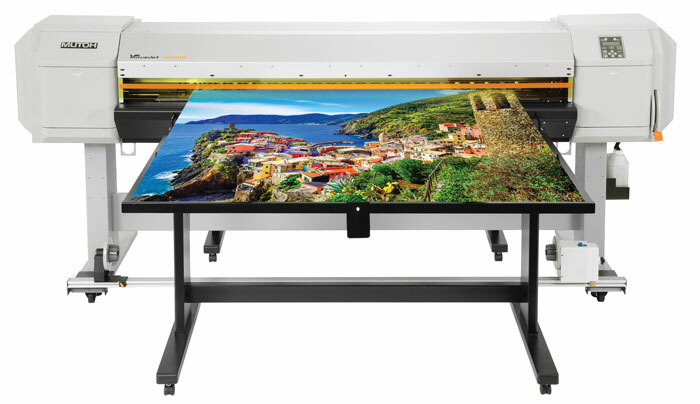 The Mimaki UJV55-320 superwide roll-based UV-LED is ideal for producing oversized images or can print onto two rolls simultaneously ideal for backlits as it has an inline LED panel. think overhead hanging signs), interior décor or production runs for custom apparel. 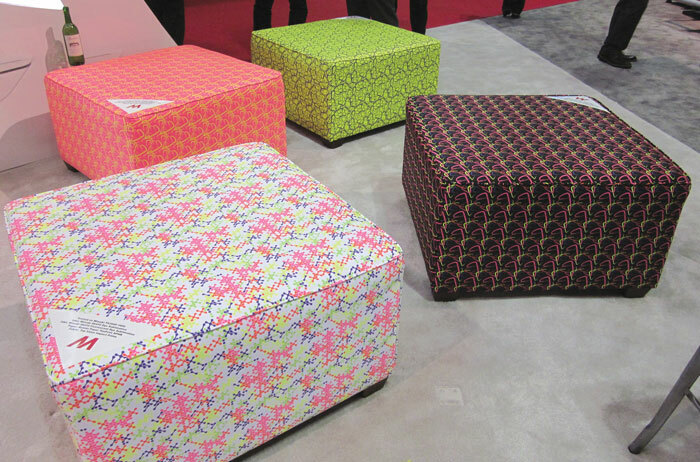 Dye sublimation using fluorescent inks helps the colors on these ottomans pop. Roberts: The steady increase in demand for specialty graphics is opening up lucrative opportunities for both manufacturers and PSPs, and we expect this trend to continue in 2017 and for years to come. As mentioned, the personalization and customization of various items and products is also resulting in greater demand for UV printers and inks. Not only are users able to print their basic "bread-and-butter" jobs that sustain their business, but they can also venture into other cool, new, artistic projects that garner higher margins. Innovative printers and inks that enable users to capitalize on these trends are becoming increasingly popular. New printers allow users to print on everything from lunch boxes and laptops to tabletops and doors. 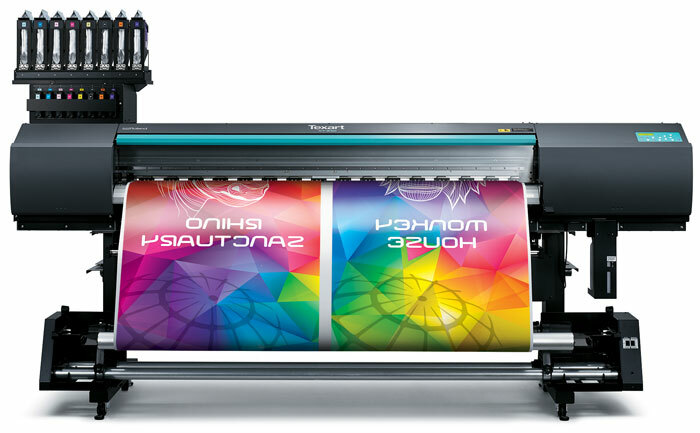 The Mutoh VJ1638UH hybrid printer features a staggered dual printhead design for faster print speeds and dual UV lamps, on either side of the printheads, for exceptional cure times which allows for higher production capacity. 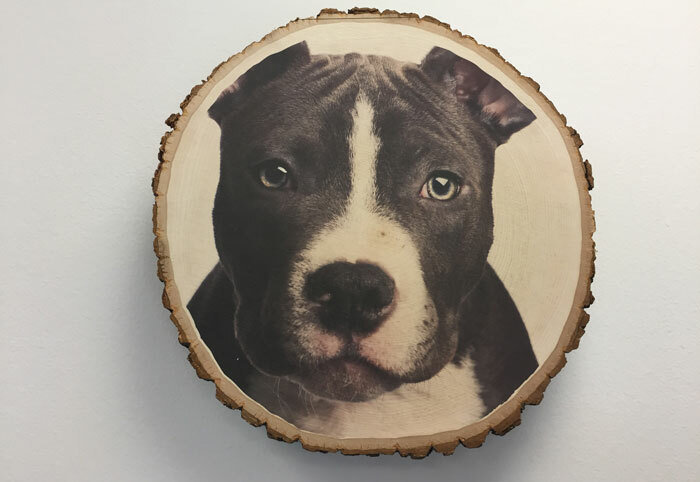 Printed using the Mimaki UJV-7151 plus bench top UV-LED printer directly onto untreated wood. What are some of the new options in media and ink? Roland: Fisher Textiles' wrinkle-resistant backlit material is engineered for light dispersion to produce backlit prints. It has a slight stretch for a tight fit and presents an extremely vivid print that is amplified when backlit. A treated version is available for direct dye sub, UV and latex printing and an untreated version is available for dye sub transfer. 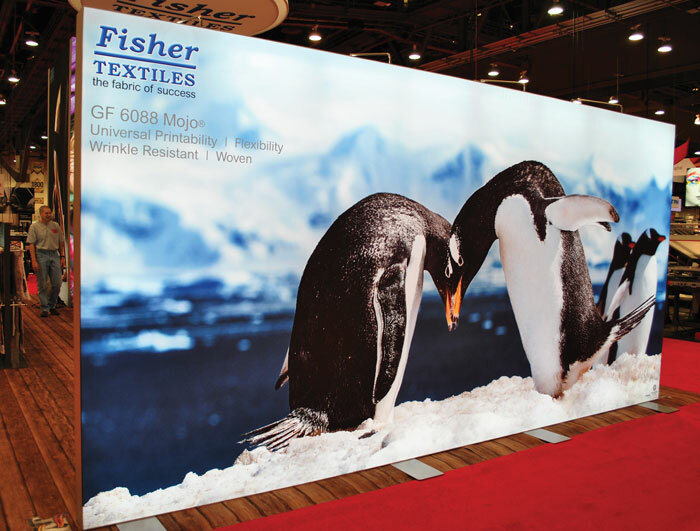 This fabric was awarded SGIA's Product of the Year award for Media Framing Systems. We just recently released a new fabric for frontlit SEG, for UV, direct and transfer dye sub printing. It is a specially treated fabric that is very stable. Wittenberg: In terms of inks, latex inks continue to develop in the areas of durability and scratch-resistance. This has allowed the sale of printers into traditionally strong solvent/eco-solvent applications such as wraps and outdoor signage. Media, too, continues to develop, although not at as rapidly a pace. The fact that inks are becoming more robust is allowing them to be used on more existing media which is driving growth. Hunter: When it comes to media, new options include a greater variety of "green" media for output providers to choose from. For the most part, this wider choice of eco-friendly materials has resulted from the need to meet new and changing environmental laws and regulations. For inks, demand is steadily growing for newer offerings like fluorescent inks for dye-sublimation applications. Specially formulated UV inks are also extremely popular, enabling users to increase the value of their products by adding not only vibrant color graphics, but also unique varnish and embossing effects. Manufacturers like Roland continue to offer customers a wider option of eco-solvent inks as well, including cost-effective formulations that deliver not only wider color gamut, but also faster drying and greater media compatibility. McConnell: Some of the new media options that we see resonating with our partners is lighter weight materials to help drive down shipping expense. Medias like metallic-faced foam core substrates and expanded PVC with simulated surfaces (like wood grain) help print providers offer high end and eye-catching products, while saving clients freight charges. Media continues to become more earth-friendly, and we see that print providers and end users are very conscious of green products. As far as new options for ink, we have released an ink specific for printing on corrugated as we see growth in that market. It features a low odor, more similar to what a print provider would expect from offset or flexo. Ink development and R&D are critical to success in regards to inks for high production machines, and customer demands like ink for food packaging and application-specific inks will continue to help push the development of wide-format inkjet technology and where it fits. Conrad: Flexible UV ink will open doors for even more applications while white and silver provide alternatives for various applications such as prototypes, specialty labels and stickers. Developed specifically for dye-sublimation transfer printing, the Texart XT-640 was designed to deliver outstanding print quality on long print runs, day after day. Maxwell: Media coating options have advanced quite a bit in recent years, and media manufacturers have improved their offerings. Most print service providers only utilize one side of the medium, which has opened up the possibility for manufacturers to offer multi-use products. Some products are coated on one side for solvent, UV or latex, and are able to be sublimated on the reverse uncoated side. Improvements in ink flexibility and durability, plus expanded color offerings, have also improved compatibility with these media and have enabled PSPs to offer wider gamut prints with ink technologies that were previously limited in those areas. Larson: 3M has recently introduced more non-white print films such as a clear printable wrap film, which allows graphic manufacturers to tap into their creative side when offering wrap solutions to their customers. We also introduced one of the first printable, wrappable metallic films that allows installers to achieve shimmering accents and bold statements in an innovative way. Where are the new and emerging markets for output providers? Roland: New fabric markets for output providers include sports marketing, festivals/events and apparel. Ample opportunities are available in sports marketing for end uses including but not limited to: stadium graphics, outdoor graphics, acoustical aids and media backdrops. For festivals and events, custom printed canopy tents, promotional table throws, printed crowd control barriers and backdrops for red carpet events are all becoming very popular uses of fabric graphics. Apparel is one of the fastest growing markets for output providers. Custom apparel products are a hot trend in our industry, driven by consumers, sports organizations and corporate sponsors looking for soft, comfortable clothing with a personal touch. In recent years, fabric manufacturers began to offer apparel products made from recycled yarns, due to consumer demand for more environmental friendly products. These fabrics are made with recycled yarns from PET bottles, the result of closed loop recycling. Applications for apparel include mainly active wear such as jerseys, sports shirts, yoga pants and leggings. All of these require a moisture management system that is present in fabrics geared towards apparel applications. Swimwear is also a growing application in the apparel market. Hunter points out that Roland's Texart fluorescent inks that are ideal for differentiating apparel and other types of output with bursts of vivid, eye-catching color. 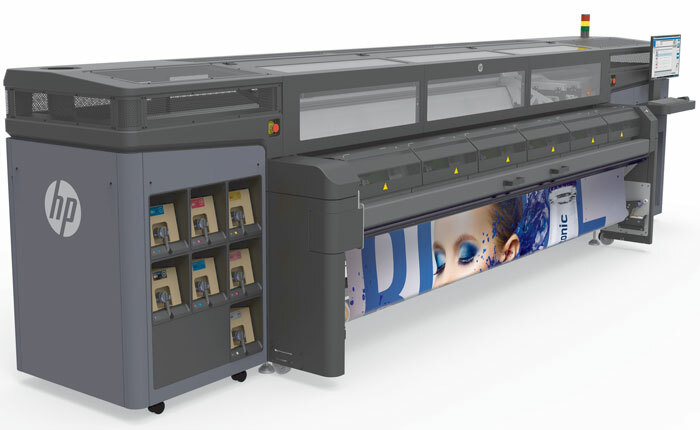 Conrad: Specialty, electronic and industrial markets offer opportunities for print providers to capture business with new ink technology and printing capabilities of wide-format devices on the market today. Wittenberg: Decoration is a big emerging trend. Wallpaper, window blinds and canvases, and corrugated displays are in the early adoption phase for those willing to enter the market. The growth rates and margins are creating repeat purchases from the early adopters, enabling them to gain market share. Soft signage and textiles are other markets that are starting to grow at the expense of traditional signage. In many cases, however, this requires the purchase of dye sublimation equipment, which takes the PSP out of their normal technology if not already in the dye sub market. Maxwell: With improved printer speed, ink and media compatibility, we are seeing a trend of small- to medium-sized producers taking on larger jobs that may have traditionally been outsourced. This trend has opened a market for these smaller providers to bid on jobs at museums, airports, hospitals, etc. What are some of the best new applications and business opportunities for shops? Roberts says that the personalization and customization of various items and products is also resulting in greater demand for UV printers and inks. "Not only are users able to print their basic 'bread-and-butter' jobs that sustain their business, but they can venture into other cool, new, artistic projects that garner higher margins," he adds. Roberts: As mentioned, dye sublimation and UV product personalization/customization represent two rapidly growing, potentially lucrative markets that PSPs can tap into. Both of these technologies are helping output providers grow and succeed. While people usually associate dye sublimation with fabrics and textiles, the possibilities go beyond those applications. 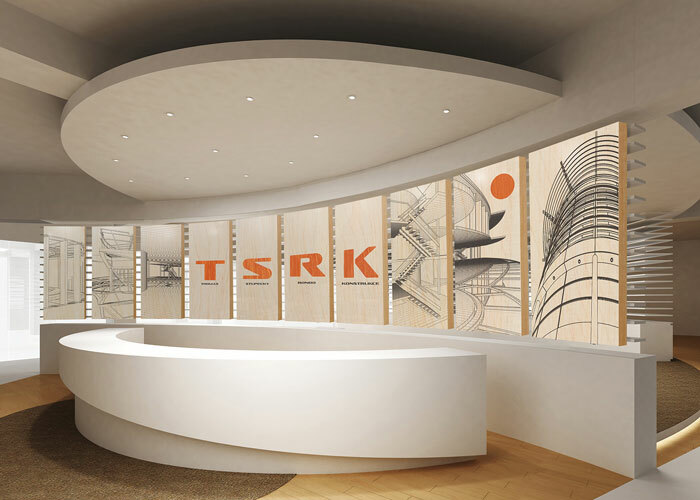 There are many rigid substrates that can be sublimated as well, including table tops, flooring, wall panels and more. UV printers and inks are also opening up new business opportunities. One of the fastest-growing trends in the graphic arts industry is the use of specialized UV inks to create stunning dimensional and textural effects that really make the graphics "pop." We are also seeing new developments and creative opportunities in mixed-media printing and art production. Experimentation leads to new, amazing processes and possibilities. Corporate lobby graphics were created using the Roland VersaUV LEJ-640FT printer. Wittenberg: The most immediate applications are the corrugated displays for retail environments, soft signage to replace existing rigid or flexible signage. Maxwell: On the signage/graphics side, traditional applications such as banner and PVC still dominate demand; however, backlit, fine art and retail soft signage seem to be driving the newest opportunities with roll-to-roll devices. UV flatbed technology continues to present demand in the signage space, and object decoration is being rapidly adopted due to the virtually limitless applications and easy integration into many print environments. Whether you are an existing PSP or just starting out, the currently available technologies will all provide many opportunities for success. Wittenberg says Latex inks continue to develop in the areas of durability and scratch-resistance. This has allowed the sale of printers into traditionally strong solvent/eco-solvent applications such as wraps and outdoor signage. Conrad: Textile industry applications, specialty and traditional screen printing applications are areas where digital printers are looking to grow their business. Ink and printer technology are growing to support these non-traditional markets. Larson: At 3M, we believe new, reflective products will open up many great opportunities to apply reflective films to buildings, parking garages and other types of walls. Films like these provide installers with a film that stands up to the rigorous wrapping process that includes repositioning, elongation and conforming without severe bruising. It also features self-healing properties that keep the reflective quality of the film shining bright. Bill Schiffner has covered the imaging industry for more than 25 years. He has reported on the many new digital technologies that have reshaped the imaging marketplace. This article appeared in the SGIA Journal, May / June 2017 Issue and is reprinted with permission. Copyright 2017 Specialty Graphic Imaging Association (www.sgia.org). All Rights Reserved.